With pride we are presenting you this information on StatUS™, which we believe is the most exciting and innovative product in physiotherapy, developed by Enraf-Nonius. Did you ever think how ideal it would be if you could conduct your ultrasound treatments without having to sit with the patient, moving the treatment head over the injured tissue? And wouldn’t it be great if you could really transmit ultrasound energy right there where you need it and only there! 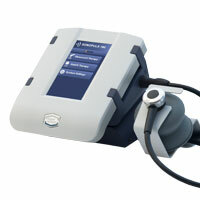 This is no longer a dream, Stationary UltraSound (StatUS™) makes it possible! Not only is this treatment more beneficial to your patients, but it also saves you time in order to conduct other activities. Imagine the significant cost savings in the future! We trust that StatUS™ will intrigue you too and for this we have created the website www.enraf-nonius.com/StatUS where you can find even more detailed information on the product and the therapy. Enjoy StatUS™, the innovative, unique hands free ultrasound! StatUS™ is available in the Enraf-Nonius 6-series (as StatUS unit or as module) or as an addition for the Sonopuls 190 (the StatUS Pack 100).